With all the wildfires, Smokey the bear sought safety inside a storm drain but ended up getting stuck. 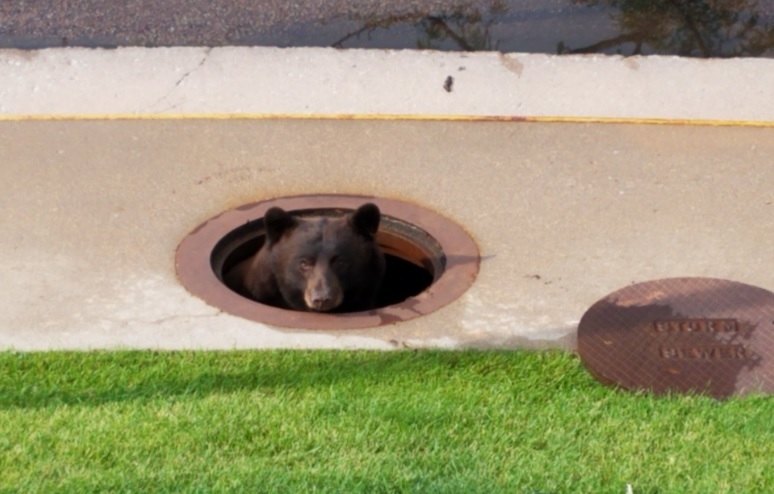 The bear somehow managed to end up in a suburban Colorado storm drain but thanks to some wildlife workers, the bear was able to climb free. Colorado Parks and Wildlife's Southeast Region aided in the rescue effort and shared a dramatic video of the bear climbing out of a manhole. After the 250-pound bear climbs out of the manhole, Colorado Springs Utility workers shouted and made loud noises to scare it away. A Parks and Wildlife officer error on the side of caution and fired a rubber bullet to help scare the bear away from the area. Wildlife officials said it was important not have to have to tranquilize and relocate the bear or it could lead to it being euthanized in the future. They also avoided any physical contact which would require them to give the bear an ear tag. According to a CPW wildlife biologist in Fort Collins named Mark Vieira, there are more bears in Northern Colorado than there were 30-40 years ago, A recent study from three consecutive summers in a 240-square-mile area near Poudre Canyon found an average of 10 bears per 100 square kilometers.